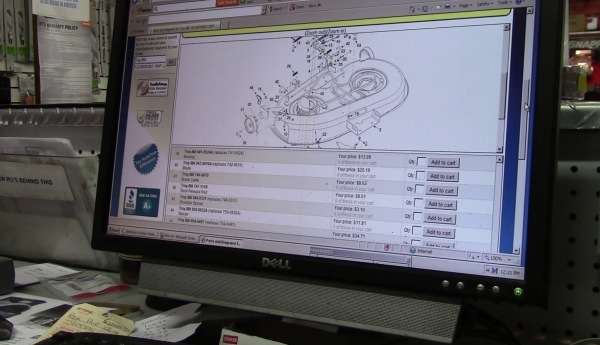 Our computerized parts identification system contains over 750,000 parts. Just tell us your make and model number and we'll get you the part you need. Don't know your make and model number? Follow the links above under parts to locate it. Still not able to locate it? No sweat, just bring your equipment in and we'll figure it out. We stock the most popular OEM parts for all of the brands we sell as well as popular parts for most of brands carried by the big box stores. Don't worry, If it's not in our parts inventory our suppliers will have it and can ship to us next day at no additional charge to you. The first step to finding the parts you need is to locate the manufacturers model number. Remember, most power equipment has a model number for the unit and a seperate model number for the engine. If you needs parts for the engine then your model number will be found somewhere on the engine not on the unit itself. I'ts different for each engine manufacturer so we've added a link below to help you find it on popular engines. If you needs parts for the unit then your model number will be found somewhere on the unit itself, not on the engine. Each manufacturer places the unit model number in different places so we've added a link below to help you find where to look on most types of equipment. Provide us with your make and model number and we’ll help identify the part you need from an illustrated parts diagram and then search our database of over 750,000 parts to find the OEM or aftermarket part you need.